Excavations have shown that people have lived on the Palatine Hill since one thousand years before Christ. The historian Livy wrote that the original Romans lived there. Many affluent Romans of the Republic Period (510 B.C. to 44 B.C.) had their homes there. During the period of the Empire (27 B.C. to 427 A.D.), many emperors had their palaces there. You might say that the Palatine Hill was the best neighborhood in Rome. In July 2006, archaeologists discovered the Palatine House, which is believed to have been the birthplace of Augustus, Rome’s first emperor. A section of corridor and other fragments were discovered under the Palatine Hill, which one archaeologist described as “a very aristocratic house.” The two-story house was built around an atrium, with frescoed walls and mosaic flooring, and is situated on the slope of the Palatine that overlooks the Coliseum and the Arch of Constantine. Extending across the Palatine Hill and looking out over the Circus Maximus is the Flavian Palace, which was extended and modified by several emperors. The greater part of the palace was built during the reign of the emperor Septimius Severus (146 B.C.-211 B.C.). Adjacent to this palace is the Hippodrome of Domitian, which was kind of a small stadium for foot races. 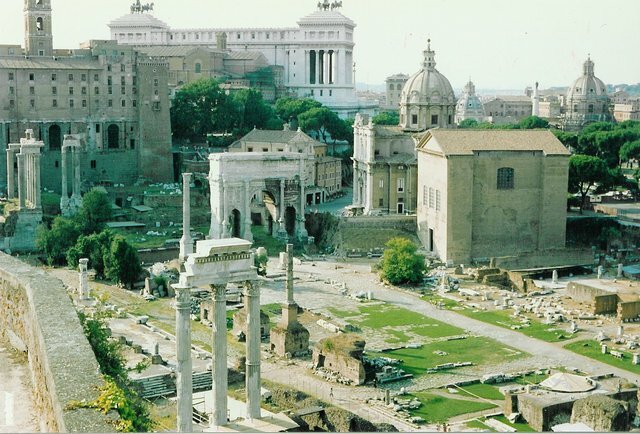 Today the Palatine Hill and the Roman Forum beneath it are a large open-air museum and welcome thousands of visitors a day. If you are going to “do” Rome anytime soon, the Palatine Hill should be well worth the time and effort it takes to see it.